What makes a good computer for business use? I think you’ll agree with me when I say that if you’re trying to choose a new computer for your business there’s a lot of choice. In this article, I’m going to share with you exactly how to choose the right PC for your business needs. I’m going to do this by walking you through what how each part of a PC effects what you are working on daily in your business. This is the first place to start. Are you going to be doing high-end video editing? Basic office admin duties or a power user that needs lots of excel documents open to cross reference. This is the question you have to answer before the rest of this article falls into place. So answer that in your mind now. This is a bit like a brand recognition, you’ve got HP, Dell, Sony, Acer etc. You’ll probably gravitate to one of these names because of the brand recognition. When it comes to business PC’s there are about 3 real choices. HP, Dell or Lenovo. If it’s a desktop PC then usually HP or Dell. Well, it’s the after care support when there’s a hardware fault. You may have an IT support person helping you out. Both HP & Dell have business support lines and well versed in helping businesses with their hardware issues. This will save you or the IT person time so choose either HP or Dell. Personally, I prefer HP but it’s really just about aesthetics especially when it comes to laptop purchases which is a completely different post for another day. The big two CPU manufacturers are AMD & Intel. 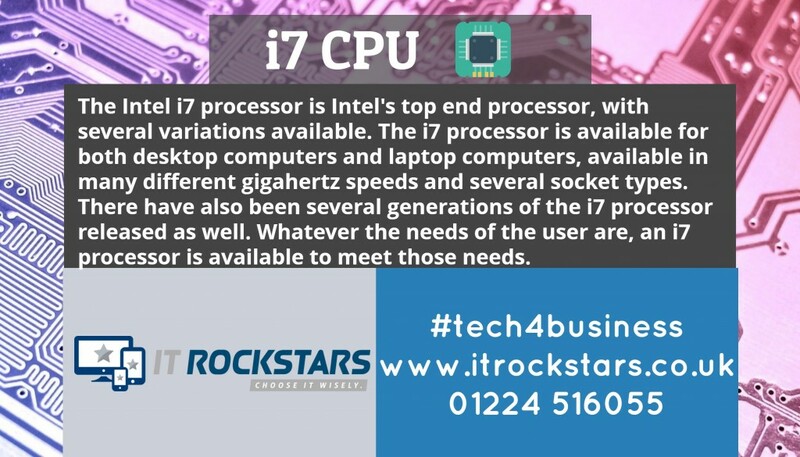 Choose Intel as they have a better quality CPU at the time of writing this article. Intel’s CPU’s come in 3 flavours i3, i5 & i7. The i3 can pretty much be ruled out unless you’re on a very strict budget and plan to upgrade your PC in the next 24 months. It is worth the extra money to jump to the i5. The i5 CPU covers most tasks and will be fine for about 90% of all PC related processing. The only place where it can be beaten is video editing and graphics rendering. That’s where you should choose the i7. Video of graphics, if you are not doing either of these then it’s worth taking the i5. This is what we here at IT Rockstars quote for on all PC build unless it’s classed as video/graphics workstation. Since the inception of Windows 10 RAM on a PC is not as big a deal. Windows 10 can manage memory usage very well. At a minimum you should be purchasing a system with at least 4GB of RAM, however, I would recommend 8GB as standard as this will future proof your system for the next 3-5 years. The hard drive in the system is the bit that stores all the files. Hard drives are cheap nowadays and you’ll find as a minimum that 500GB is the standard size for most business PC’s. This is a good amount of storage unless again your are editing video or working with graphics files. The other part to storage is the type of device inside the system . 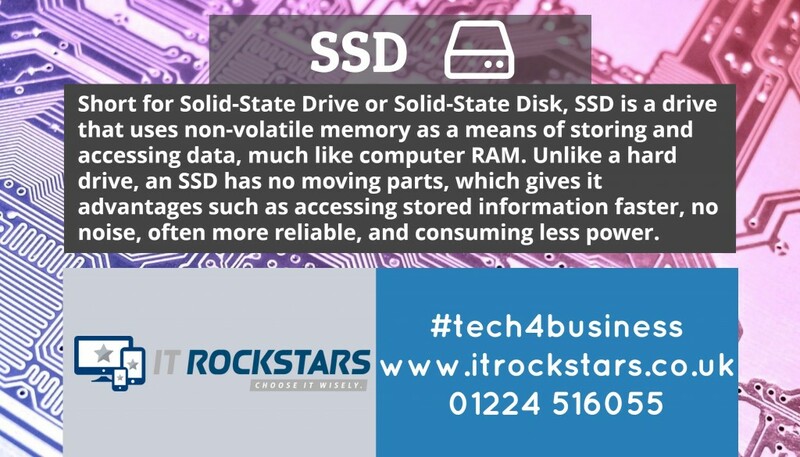 There’s the standard hard disc drive, however there is a much better alternative called a solid state disc (SSD). The SSD has no moving parts so works much quicker and it’s a fact that if you have an SSD in your system you’ll actually save between 10-20 minutes each working day waiting for your PC to do things. Solid State Disc – Worth upgrading to this. This is massive, for an office of 5 staff that’s about an hour a day. Do the math and the SSD is a real no brainer. The only issue with SSD’s is that they don’t come as standard inside a system. They are an additional purchase and will require an IT professional to install. There’s a bit of investment here but well worth it when you factor in the amount of time you’ll be saving by having an SSD in your new system. Windows 10 is now the defacto operating system of choice for PCs. If you have a business with more than 5 PC’s or plan to grow I would choose to have the professional version of Windows 10. This will allow you to join your computer to a server for local file storage etc. The Windows 10 home version can still be used in business, however, there is no option to join it to a server and will require that you upgrade the operating system in future if this becomes necessary. Will my old software run? Some businesses may have older software that is not suitable for newer operating systems but still needed in the business. Windows 10 does have the ability to run software applications in a compatibility mode to handle older bits of software. However, the compatibility mode does not always do the trick and this is when you may require running a virtual instance. If this is the case make sure to choose a PC with at least 8GB of RAM. Whilst you might not think this is important it does help to think this over before purchase. Where would you prefer the PC to sit? On your desk under your monitor or under your desk? Ask this question to yourself when choosing a PC as you’ll need to purchase the correct type of desktop PC if you want it sitting under your monitor. There is also the all in one PC systems which have gained some popularity where actual PC is built into the monitor. This is a real space saver however, the main drawbacks on the all in one PC systems are that they usually not as powerful, can’t be upgraded in future and because the operation temperature is that bit higher don’t usually last as long and have a higher failure rate. Keep this in mind. They might look nice and be practical but do fail more regularly. Especially if it’s something that’s used every day. This is more of a personal preference. What type of keyboards & mouse do you want? You’ll usually always get a basic set as part of the PC purchase but what I would suggest you avoid especially in an office environment is wireless keyboard & mouse. The main reason I suggest to avoid these is that if you’ve got multiple staff you’ll eat through batteries on a monthly basis and can be a real pain if there are no spare batteries kicking about. The bigger the better. Recent studies (source link here) have said that the bigger your screen resolution the more work you’ll get done. Now if you want to be really efficient you might even think about a dual monitor setup. I personally had this for about a year before switching back to a single large monitor. It’s really a matter of preference. Where I would say dual monitor setup comes into their own is when editing videos or working with multiple excel document that you might have to cross reference for accounting purposes. Ideally, it would be an HP or Dell with a 500GB SSD, i5 CPU and windows 10 professional. This is an all rounder and if you’re looking for a quote we here at IT Rockstars would be happy to assist. I’ve not covered Apple Mac’s or Laptops in this post those are for future articles. If you found this article useful please sign up to our newsletter.